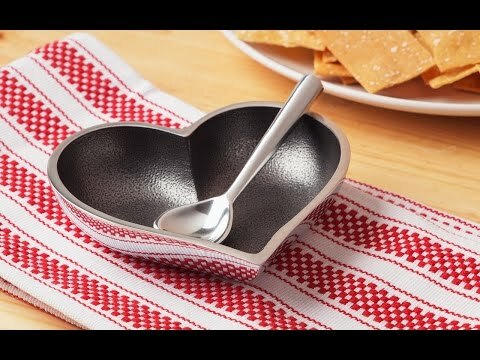 This little dish told her, "I love you" when I have it to her. She tells me she loves me by keeping it continually filled with delicious treats. Catch-all dishes by Inspired Generations keep things neatly contained with a touch of whimsy. Made from durable, food-safe aluminum and stainless steel, they’re handcrafted to be sturdy and versatile, and won’t chip or tarnish. 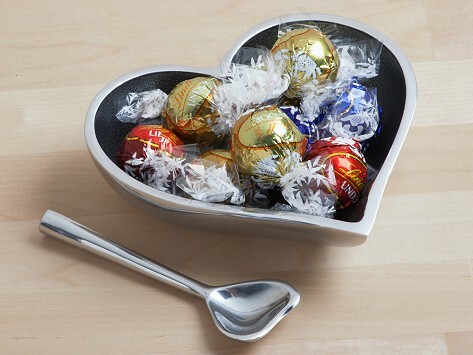 The Heart Shaped Dish features a painted interior and a matching heart-shaped spoon—use it to share treats, or use the dish alone to hold odds and ends like hair ties, paper clips, or jewelry. The royally cute Crown Jewels is the perfect spot to safely stash jewelry, like rings, next to the sink or on top of your bureau. Or for the manly man in your life, the Macho Man is like a mini all-in-one valet to corral a watch, loose change, or whatever else needs to be kept tidy.